The Charming Tails range of figurines was created by artist Dean Griff. 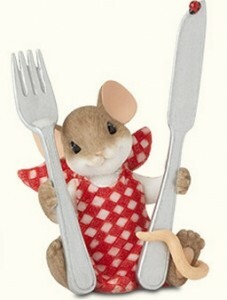 Dean Griff’s artwork and designs of woodland animals (especially mice) are sculpted into extremely cute figurines. The Charming Tails come as single figurines, hanging ornaments, waterglobes and more. Their popularity is growing and early pieces are already fetching higher prices on the secondary market. Dean Griff is pictured right at a signing event. 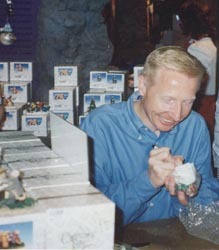 The first figurines appeared in 1993, initially under the name Woodland Collection, and produced by Silvestri. Pictured left: 2014 Membership Gift “Hungry for More”. They were renamed Charming Tails the following year and the production moved to Silvestri’s parent company at the time, Fitz and Floyd. A number of collections have been produced including the Squashville Village, a range of lighted houses where the characters of Charming Tails reside. The Charming Tails range is now produced by ENESCO. The Charming Tails Leaf & Acorn Club provides news and information about Dean Griff and his Charming Tails creations. The The Charming Tails Leaf & Acorn Club theme for 2014 is, “Life is a Picnic” with the Symbol of Membership being Hungry for more. Members also receive an Exclusive Member’s Only lapel pin, and issues online of the Squashville Gazette, a downloadable catalogue and the opportunity to purchase two exclusive Members Only Figurines which for 2014 are Ant No Picnic Without You and King Of The Grill. NOTICE – This site is not affiliated with Charming Tails TM or ENESCO. The purpose of these pages is to provide information to collectors of Charming Tails figurines.